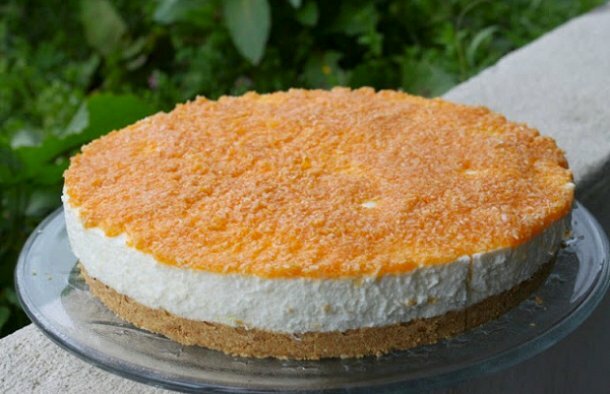 This Portuguese pumkin cheesecake recipe is perfect for anytime and makes a great dessert. Chop up the crackers in small pieces. Add the melted butter and knead well until a homogeneous mass is obtained. Line the bottom of a pie pan with parchment paper, place the mixture in it and press it firmly. Place the gelatin sheets in water for five minutes. Drain it and melt it in the microwave. Beat the cream until it is well blended. Add the condensed milk and beat some more. In a blender, place the goat cheese in pieces, milk and sugar and beat for five minutes. Add this mixture to the cream and the gelatin as well. Stir in the lemon zest and juice and mix well. Pour the mixture over the base in the pie pan. Place it in refrigerator, if possible overnight. When serving, top with pumpkin jam and shredded coconut. 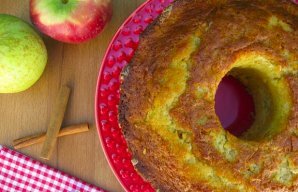 This Portuguese yogurt, apple and cinnamon cake (bolo de Iogurte maçã & canela) is light, fluffy and loaded with apple. 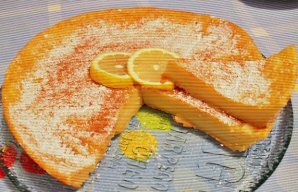 This Portuguese lemon tart recipe (receita de tarte de limão) is very, very easy to make and tastes incredible. 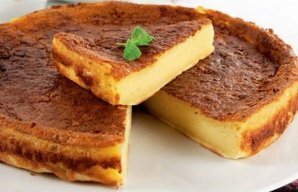 This Portuguese milk and cinnamon tart recipe is very easy to follow and quick to make.